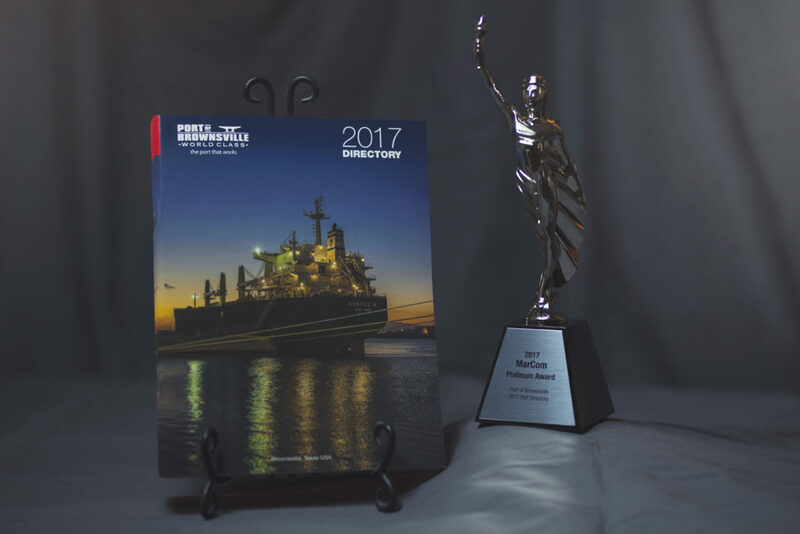 BROWNSVILLE, Texas — The Port of Brownsville directory was recognized with a 2017 Platinum MarCom Award for its inaugural port directory in the government publications category. “On behalf of the commissioners, I congratulate the port’s marketing and communications team for their hard work and creativity, and for bringing a new level of transparency to the Port of Brownsville. This small group of individuals consistently demonstrate a high standard of excellence,” said John Wood, Brownsville Navigation District Chairman. The 2017 port directory is a comprehensive 84-page magazine style guide featuring helpful articles detailing the advantages of doing business at the Port of Brownsville, photos and graphics highlighting the port’s operational specifications, a pullout facilities map and contact information for tenants at the port. The 2018 edition of the port directory is currently under production. Advertisers may contact Patty Gonzales, director of communications, at pgonzales@portofbrownsville.com or (956) 838-7004 for more information. MarCom is one of the oldest, largest, and most prestigious creative competitions in the world. It is sponsored and judged by the Association of Marketing and Communication Professionals (AMCP), a 23-year-old international organization consisting of several thousand creative professionals, and is the industry’s pre-eminent third-party evaluator of creative work. The organization has judged over 200,000 entries since its formation in 1994. A complete list of award winners may be found at https://marcomawards.com/.